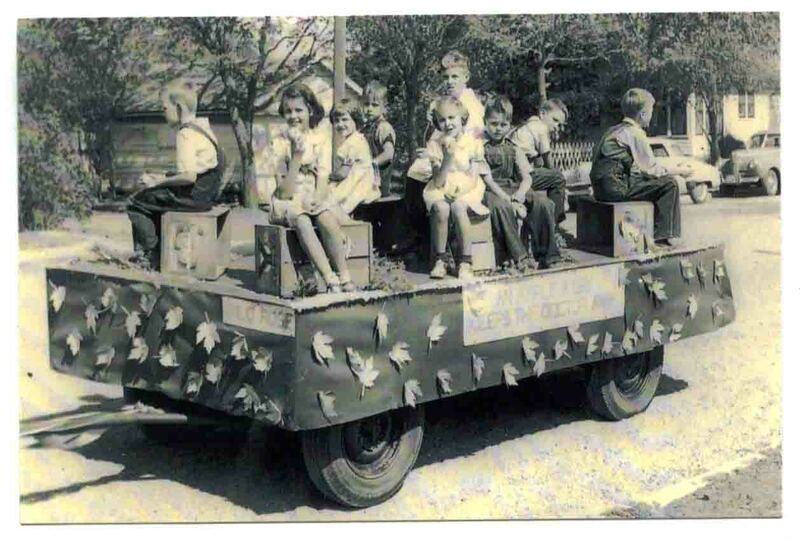 Wild Rose school float 1947. Nine students on Wild Rose school float. Banner on float reads "An Apple a Day Keeps the Doctor Away". Students eating apples furnished by Henry Neufeld's orchard. Children are sitting on apple crates. Leaves are attached to the sides of the trailer. Left to right: John Flickinger, Greta Epp, Virginia (Virgie) Neufeld, Gary Koehn, "Doctor" Henry Lane Neufeld, Mary Jane Neufeld, Carl Epp, unknown, and James Epp. Picture dated 1947. 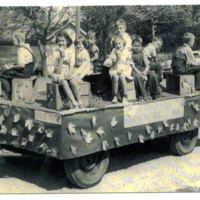 “Wild Rose school float 1947.,” Digital Halstead, accessed April 20, 2019, https://halstead.digitalsckls.info/item/74.